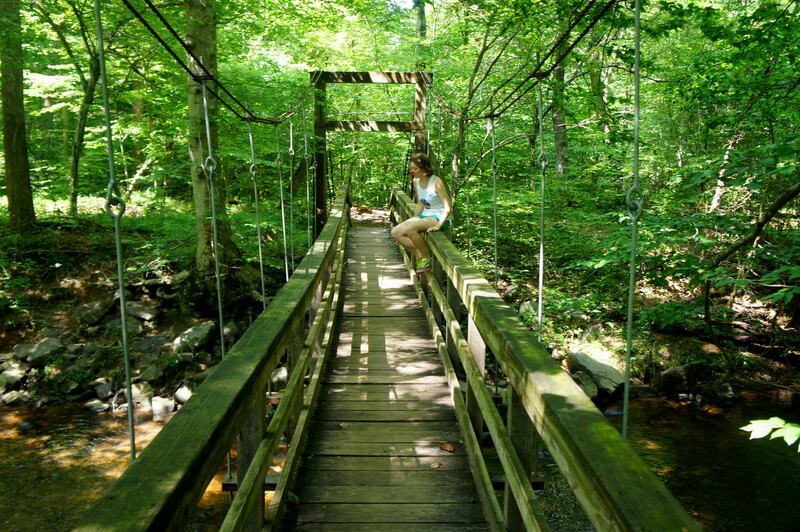 Prince William Forest Park spans 17,000 acres of peaceful woods, hills, and rolling streams on the edge of the Tidewater region of eastern Virginia, roughly 30 miles southwest of Washington, DC. The Birch Bluff Trail Loop offers a short but pleasant stroll that takes off just behind the Visitor Center near the park entrance. 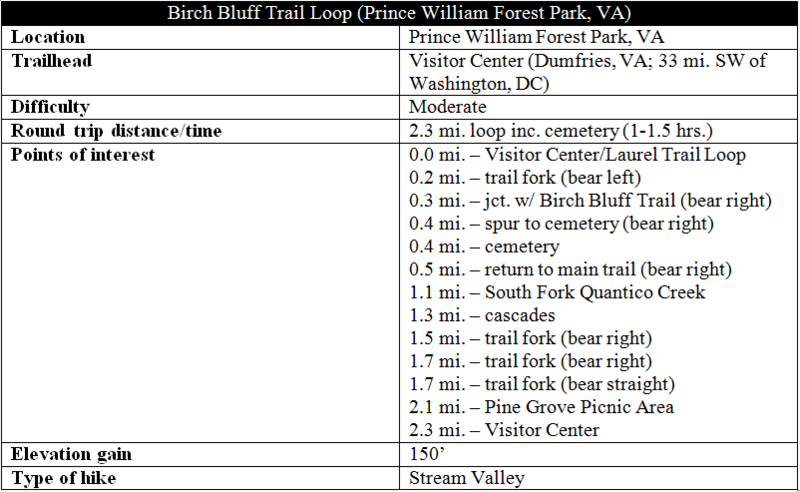 Getting from Washington, DC to Prince William Forest Park along traffic-clogged I-95 can take about as long as the hour-long hike, so it’s best to pair the Birch Bluff Trail with some of the many other hikes in the park to make a day of it. Take the first right after entering the park, then a left, to reach the Visitor Center. The trailhead for this hike is not necessarily obvious. Departing the Visitor Center, walk toward the restrooms (in a separate building), then look for a trail sign off to the right, about 30-40 yards away at the edge of the woods. This is your starting point. The first 1/3 mile actually requires walking on the Laurel Loop Trail, which quickly enters the deciduous forest. The sandy path leads downhill to the first trail junction at 0.15 miles; stay left. After another slightly downhill section, take a right at the next fork to begin the Birch Bluff Trail. 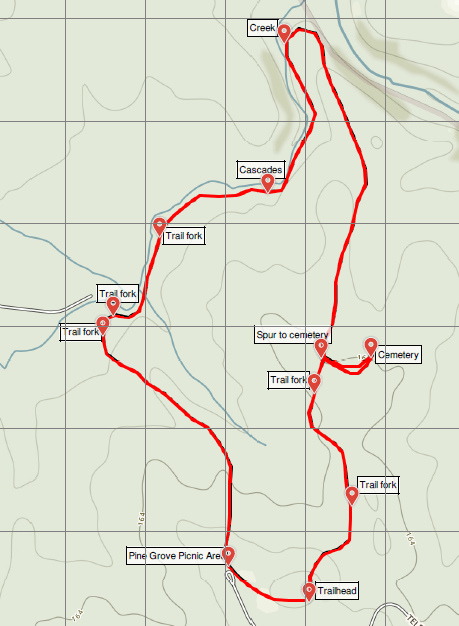 Follow the red blazes as the trail briefly climbs a set of four stairs, then reaches a third junction at 0.35 miles. Take a short detour by heading right to see the Cannon Reid Cemetery (lovingly misspelled as “cemetary” on the sign), the resting place for a one Euriel Reed (1884-1918) and M. Cannon (1976-1873), among others. (Note: Presumably former residents of the area?) 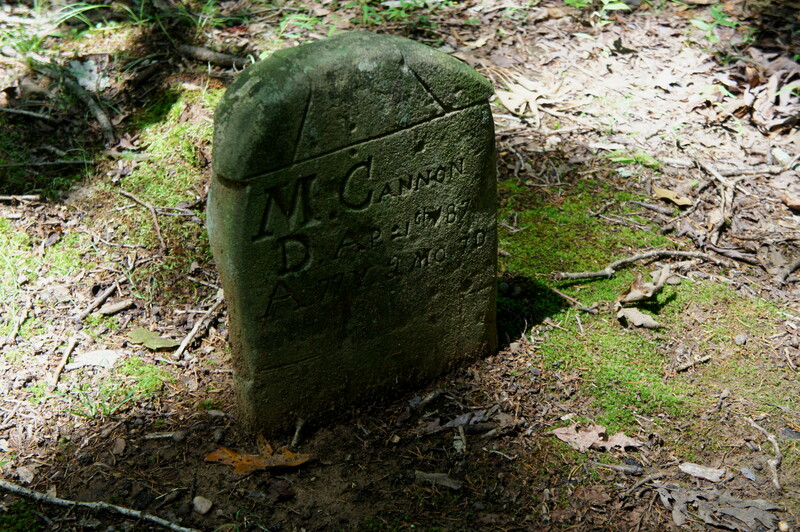 The first gravestone is situated about 200 feet down the narrow footpath on the right, while M. Cannon’s grave marks the end of the short spur trail along a woody ridge. Retrace your steps, return to the main trail, and continue right. Around ½ mile further, the rate of descent steepens as the sound of running water finally comes within earshot. 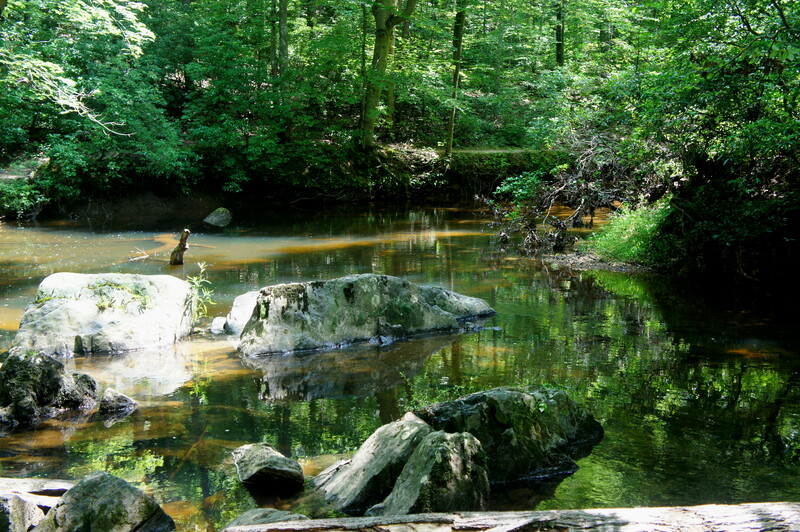 Nearing the confluence of the North Fork and South Fork of Quantico Creek, the trail bears left at around one mile and reaches the banks of the South Fork. 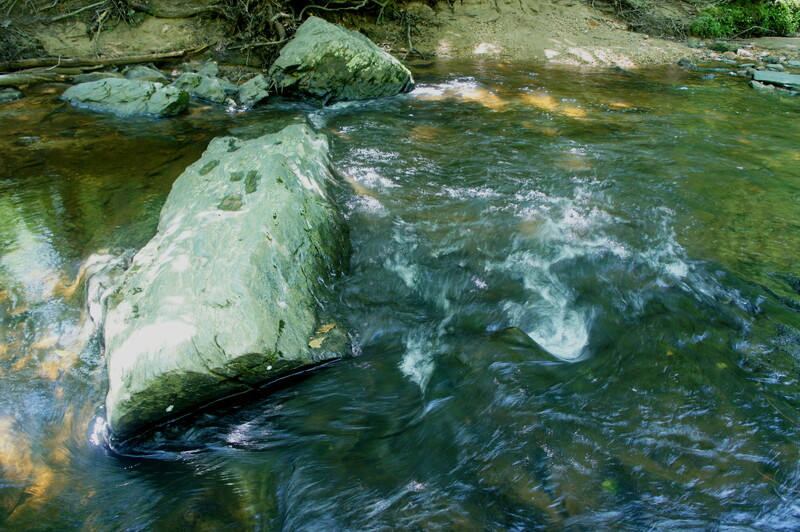 From here the trail follows the creek upstream; there is a nice swimming hole at roughly 1.2 miles. Across the creek, it is easy to spot hikers along the longer and more popular South Valley Trail, which hugs the west bank. 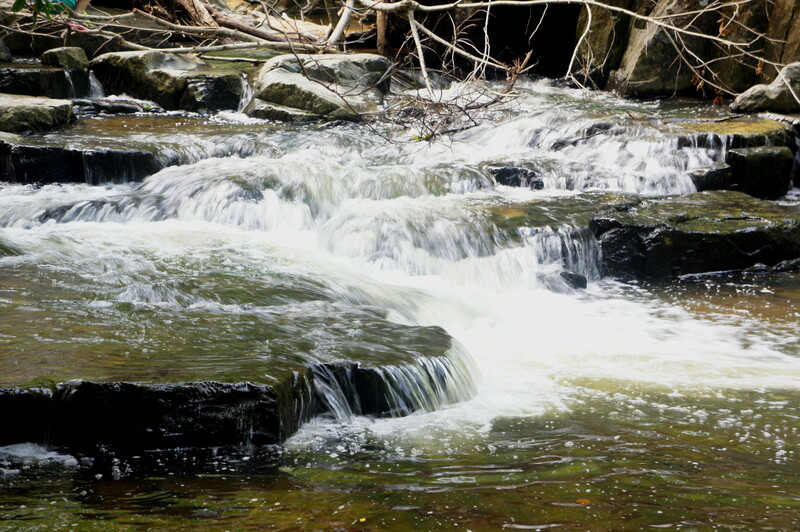 As the scenery becomes notably rockier on both sides, hikers will approach the highlight of the hike—a small cascade spanned by a group of fallen trees—on the right at about 1.3 miles. 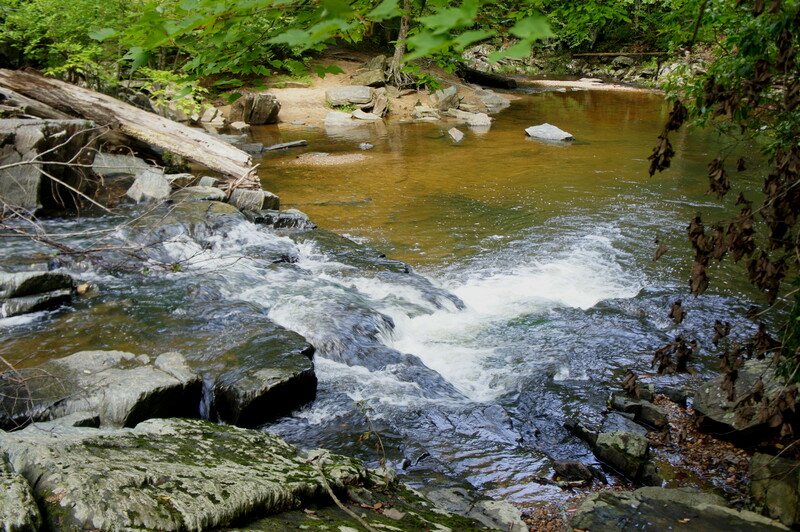 Just beyond, the creek is calm, still, and shallow. At 1.5 miles, take a right to follow the Laurel Loop Trail back to the start, or—as yours truly did—continue along the creek, now on the Laurel Loop heading west, for another 300 yards to reach a lovely suspension bridge on the right. The route also forks here; take a left, heading uphill away from the creek, then stay straight at the next junction to head back up toward the Visitor Center. After a relatively sharp climb of 4/10 mile, the path emerges from the woods into a sunny meadow. The northern fringe of the Pine Grove Picnic Area parking area is visible ahead. Stay along the left fringe of the meadow, then cut across the picnic area—to the right of a modest playground—back to the starting point and the Visitor Center. Allot around an hour for the round-trip hike, or a little more if you stop for a snack or a swim. This entry was posted in Moderate Hikes, Prince William Forest Park, Virginia and tagged Birch Bluff Trail, Cannon Reid Cemetery, cascades, historic, Laurel Loop Trail, loop hike, Pine Grove Picnic Area, Prince William Forest Park, Quantico Creek, South Fork Quantico Creek, Virginia. Bookmark the permalink.